New or used? It's the first decision a buyer makes when deciding to purchase a vehicle. Which one works best for you will depend on your financial situation and personal preference. Of course, if it were up to us, you would buy a reliable fantastically wonderful used car like one of these great used vehicles... BUT if people didn't buy new cars, and subsequently sell them we wouldn't have anything to sell! 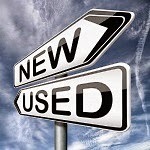 So, we decided to try to provide you with the most unbiased opinion on the pros and cons of buying new or used.. or as unbiased as possible for a used car dealership’s blog..
M-T-O... They’re made-to-order. With a new car, you are only limited by your budget. You can customize just about everything down to the sunrise chartreuse color that reminds you of the blanket your grandmother knitted for you as a child. Manufacturer’s Warranty... Sure, you can buy a great warranty with a used car, but you’ll have to pay for it. The best warranties in the business come from the manufacturers when you buy a new car. Modern Features, Safety, Etc.... New car makers are controlled and heavily legislated. Every year there are new safety standards, fuel efficiency and emission standards. What isn't regulated by the government comes with natural progress. Makers are constantly searching for technology to stay on the cutting edge and above other makers. This creates a “cool stuff” war and the beneficiary is you. Clean History? There is no history! Less Work... The only research required when buying a new car is deciding what you want. Sure there’s work in that. You have to compare models and makes. You’ll spend some time searching for discounts and deals. But not nearly as much as is required when buying a used car. Buying a used car usually entails pouring over classified ads, test driving multiple cars, driving to dealerships and securing financing. Reliability... This one is both an advantage and disadvantage. (see below “Road Tested”) A new car has never been road tested, but it is protected by a manufacturer’s warranty and Lemon Laws. If there's a defect in manufacturing, you at least have an avenue to pursue. The New Car Smell… This one’s tough to overcome. There’s really nothing like a new car smell. But remember! It only lasts for a few weeks and it costs you. Hopefully for our sake, you like the smell of money better. Value... The best reason to buy used is value. A vehicle is not a place to invest money, and any vehicle you buy depreciates each year whether you buy new or used but the largest loss to depreciation occurs when the vehicle is purchased new. In the first one minute of owning a new car, the value drops nearly 11%. By three years, the vehicle has depreciated upwards of 50 percent. At five years, your new $29,000.00 vehicle is only worth 37% of what you paid for it, and that’s no small number. Edmunds has a great infographic that details new car depreciation. You can check it out here. Price... With a used car, your dollar stretches a whole lot further. Even though you won’t be able to customize every option, you will be able to afford a lot more of them. Not spending the money on the “new” sticker means you will have more cash to buy a car with features like a CD changer, or navigation, or heated leather.. even if it’s in black instead of “gray midnight mist”. Stress... Having a new car means you worry about every scratch, ding and mark. You avoid hard roads and tight spaces. Used buyers have already had someone else go through the “break in” period. You’re not going to be up all night worried about how close the neighbor parked to your car.. unless you are one of those buyers that buff out dirt marks on their baby blue 1992 Lincoln Continental each night..
Insurance... The cost of insuring a used car is usually less expensive than insuring a new one. While the newest safety features may drive down insurance rates on some new cars, most are more expensive due to higher repair and replacement cost. High Pressure Sales and $500.00 for “protective silicon fabric spraying”... New car dealers are notorious for “add-ons’ like “dealer prep” (removing plastic from the seats) or “cabin air purification” (deodorant spray) that add hundreds or even thousands to your invoice. New car buyers are also more susceptible to high pressure sales tactics to get them to purchase extras that they don’t want or need. The higher the invoice, the more commission. With used car sales, the car “is what it is”. Aside from a warranty, there really aren't any add-ons for buyers to be pressured into. While used car dealerships can certainly pressure you into a sale, you won't be pressured into paying $400 bucks for "enhanced road preparation fluid".. or an oil top off..
“Adjustable” Prices... With used cars, everyone pays pretty much the same. A certain model with a certain number of miles in a certain condition is pretty much the same price from one seller to the next. With new cars, cash incentives, add-ons, dealer invoices, and cash rebates mean that one buyer purchasing a brand new Toyota Camry could pay a very different price that another buyer purchasing the same year, make and model. Road tested... This may seem like a sales pitch, but a used car can actually be more reliable than a new car. You are the test subject when you purchase a new car. You do have the manufacturer’s warranty and protection from all out lemons, but a used car has already been road tested. Any major manufacturer defects are found and corrected if it’s still driving. Choosing a new or used car comes down to personal preference, just like anything else you buy. Do you want to spend more and get the latest in manufacturing and a great warranty? Or do you want your hard earned cash to go a little further and let the previous owner take the depreciation hit? The more information you have to make your decision, the better. If you do decide on a pre-owned vehicle, check out our inventory. We have a huge inventory or cars, trucks, SUVs and vans and specialize in getting anyone an auto loan.. even those with bad credit or no credit.